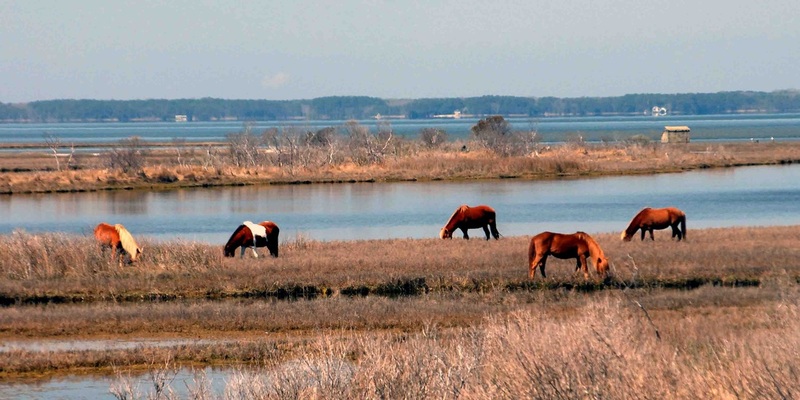 Made famous by Marguerite Henry's books, Misty Of Chincoteague, the ancestors of these tough ponies arrived on this island more than 300 years ago. My trip to Assateague National Seashore was a lifelong dream of mine. The groups of ponies number from 2-10 and are called bands. They are made up of a stallion and several mares, some with foals. They roam the Maryland end of the island free to go where they may, belong to the National Park service and sometimes receive too much attention from the humans than visit, causing illness and even death. We must respect their wildness and love them from afar. This is a panoramic image only.